The fact that Gov. Mary Fallin’s approval rating has significantly dropped and that she now finds herself in a competitive race in her reelection bid may well be part of a national growing dissatisfaction with the Republican Party on a state level. A recent post on PoliticusUSA shows how Kansas Gov. Sam Brownback, who has practically bankrupt our neighboring state through radical tax cuts, and Georgia Gov. Nathan Deal are also in highly competitive reelection races with challengers. A Daily Kos post published in April also cited even more Republican governors facing reelection problems. 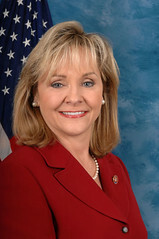 Fallin was mentioned in the PoliticusUSA post because her approval rating has dropped over the last year by approximately 20 percent, according to SoonerPoll. A recent Rasmussen poll also showed Fallin had only a slim 45 to 40 percent lead in her race against Democratic gubernatorial candidate Joe Dorman, pictured right with Fallin. Until now the prevailing wisdom has been that Fallin would coast to victory. So are voters simply growing tired of Republican-dominated state governments with their litany of ideological initiatives, such as tax cuts for the wealthy and pension cuts for state workers? Has the backlash against President Barack Obama and his fellow Democrats in red states across the country, which began in the 2010, simply run its course? It does appear likely that at least some of discontent with Fallin and other Republican governors can be associated with a general frustration among the electorate with one-party governance at the state level. Now that Obama is finishing his second term, he no longer serves as a catalyst for anger generated primarily by right-wing media outlets, such as Fox News. In essence he’s old news while the disaster of complete GOP dominance in red states has left behind its ruins. Just look at the financial shape of Kansas, which under Republican dominance led by Brownback implemented steep tax cuts for its wealthiest citizens and slashed its budget in draconian ways. Kansas has become a national spectacle of failed GOP ideology and extremism. Pundits have argued that Fallin’s drop is due to her support of outgoing and controversial State Schools Superintendent Janet Barresi and her refusal to expand Medicaid under the Affordable Care Act. I agree that Fallin’s support of Barresi, high-stakes testing and school privatization initiatives may have hurt her as well as her refusal to expand Medicaid under the generous terms set by the federal government. Fallin, of course, has recently tried to distance herself from Barresi, but she hasn’t bended yet on Medicaid. I also believe Fallin’s support for unnecessary tax cuts for the state’s oil and gas industry, along with inadequate funding for education, has created dissatisfied voters. I also think Republicans with their supermajorities in the Oklahoma House and Senate have simply not delivered the panacea they promised. The state still has budget problems, a host of social problems, such as lack of medical access, and mind-boggling incarceration rates. Earthquakes, which scientists argue are caused by the oil and gas industry, now strike the state on a regular basis and state leaders, including Fallin, have been slow to react. Republicans promised efficient government, but that just hasn’t happened. They’re too busy passing meaningless, ideological bills or bills that don’t hold up to constitutional muster. 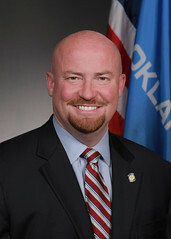 Fallin, as the state’s top Republican, is probably facing a general dissatisfaction among Republican and Democratic voters over the state’s current direction. In the end, if Dorman beats Fallin in the governor’s race, it will represent a major change in the political climate here.